Liberty House located on the main square of the quaint hamlet of Primeglio. A small garden makes the house a romantic corner of paradise. The hammock hanging beneath the pergola offers unforgettable moments of relaxation. Silence and quiet are masters, interrupted only by the tapping of the bells that mark the hours (and the half-hours, even at night! ), The noise of the passing tractors and some barking dogs. The spaces are intimate and welcoming. The house is spread over three floors: a ground floor with kitchen, living room and bathroom, a first floor with double bedroom with balcony, double bedroom and second bath; A third floor loft with large double bedroom and dormer with views over the square. The ancient terracotta floors, the vaulted ceilings or coffered ceilings make the rooms feel authentic and warm. 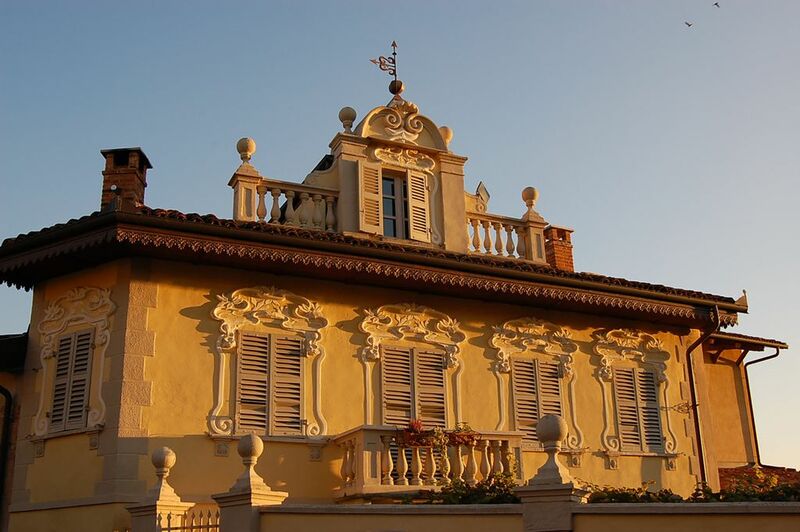 Within walking distance of the house, the Le Rondini farmhouse will offer you delicious lunches with a Piedmontese menu at zero KM. The owners, Giusy and Armando, live in Primeglio and grow the vineyard and the garden just a few meters from the farm. And for those who want to delight in the kitchen, the young Andrea Cagliero of Primeglio, a farmer's job, will ask you in front of the house a cassette with seasonal fruit and vegetables: you have nothing to ask! il manque juste un peu plus de vaisselle (couverts) parce qu'il a fallu faire marcher le lave vaisselle après chaque repas, c'est dommage! Un petit bijou de maison dans un village calme très bien situé pour découvrir la région. Et quelle région que le Piémont, aux paysages variés, des rizières de Vercelli aux vignes de Neive, aux villes et villages d'art et d'histoire, Turin bien sûr mais aussi Rivoli, Asti, Alba, Vercelli, Varallo, Susa, Cocconato, Neive, sans oublier sa gastronomie et ses vins (il faut absolument dîner à l'agriturismo "il rondini" à Primeglio) ! Elisabetta, Filippo et Luisa sont disponibles pour les bons conseils et de merveilleux hôtes. We and our 2 kids (4 and 7 years old) had a wonderful time in Primeglio. The house does not only look gorgeous from the outside but is also fully equipped at a very high standard on the inside. And if there's anything else that you need, Elisabetta - the charming and helpful landlady - will be happy to support you. And just in case anyone's wondering: yes, the house is right next to a (also lovely looking) church and yes, that church has got bells, and yes, these bells ring, also quite frequently. Though, after just one night we weren't noticing that anymore and fully enjoyed this very comfortable and atmospheric acommodation. We spent one week in this absolutely perfect and cosy house, hosted by Elisabetta and Filippo who, by the way, are the friendliest, nicest and attentive hosts I ever met. The house with charming garden has all you need and more for a comfortable stay, everything you could think for is available. By arriving we were surprised with a bottle of prosecco, noodles, oil and pomodori secchi, (we unfortunately forgot, shame on us!). Elisabetta was very helpful, informed us about sights and even booked for us in restaurants. I would recommend this lovely house to everyone and go there anytime again without hesitation - grazie mille! Accueil génial et endroit génial. Primeglio is on top of one of the wonderful hills of the high Monferrato. A few kilometers you will find the quaint village of Schierano, declared a UNESCO heritage, the beautiful Passerano Marmorito. The town of Cocconato, famous for its robiola, Aramengo where is the renowned restoration workshop Nicola, Albugnano and the splendid Abbey of Vezzolano, one of the most important Romanesque monuments of Piedmont. Primeglio is also halfway between Turin (35 km) and the city of Asti (31 km), near Chieri (20 km), an interesting center of Romanesque architecture, with its Roman aqueduct, the Jewish ghetto and ancient walls.